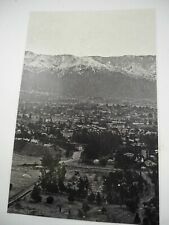 "San Gabriel Mountains with Snow 1920'S Mark James Powers Collection 11" x 17"
If an item is improperly described it would not be intentional. Almost all of my pieces are handmade, so they will not be perfect. Unsigned, but there is a partial bit of lettering in the lower right corner that appears to have the last letters of "isch". It was produced by Rodney Lough Jr. Studio in Oregon. Boulder Foothills. 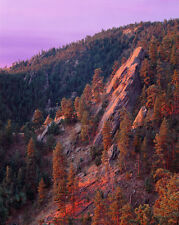 Boulder is well known for the Flatirons. These huge tectonic plates burst forth from the earth’s crust, creating the beginnings of the front range of the continental divide in Colorado. HARRY KALISH. SEPIA TONE / BLACK & WHITE PHOTOGRAPH. 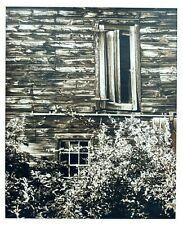 "BARN WINDOWS". EAST HANOVER, NEW JERSEY. ORIGINAL TANK AND NEGATIVE EKTA K PHOTOGRAPH. 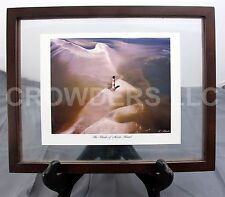 This picture is numbered and signed by Rodney Lough Jr. This stunning picture is a photograph from a limited edition of 500. Limited Edition Yellowstone Falls - Pano. Yellowstone Falls. Yellowstone National Park. AS CAPTURED BY PHOTOGRAPHER, DONALD J. MILLER. CROWN POINT, OREGON. THE VISTA HOUSE. 7 1/2" X 10" MAT OPENING / SIGHT. This image is one of Rodney Lough Jr. favorites. It is one of the iconic photograph's from his first book "Wilderness Collections". A simple delicate green stem flowing across cedar bark then blooming a series of beautiful white flowers. Photograph's on this site. This photograph was ordered and produced at Rodney's studio at Happy Valley, Oregon. His photographs under 16" X 20"are not of the premium nature of the Limited Edition and Artist Proofs but are beautiful photographs. Photographer Larry Peterka (Prism Color Lab). 1 - The Shoals of Morris Island Landscape Photography. Photo is bright and easily distinguishable.